Are you a company that wants to promote a more efficient rubbish removal system? Want to create a more proactive waste management strategy in your workplace? The use of skip bin hire services is probably the most efficient way to deal with waste removal. Construction is a busy occupation, with most materials, if not all, being used up in every project. This includes cinder, gravel, sand, stone, and many other building components. In order to ensure the stability of whatever is being built, these materials cannot be used lightly. Construction companies want to build a structure that can withstand almost anything, so cutting corners is a definite no-no. With the amount of construction being done, however, waste accumulation cannot be avoided. There is often a lot of waste produced during the building and construction process. One way of solving that is by using skip bins. With a waste removal system properly implemented, you can utilise skip bins to get rid of trash quickly and competently. Commercial companies can also benefit from the use of skip bins. The removal of waste can be done effectively, especially if it is in an urban area. Rubbish removal must also be made a priority to ensure that waste is properly disposed and taken care of. Skip bins can be used to transport components and materials to other places. Following this green approach, it may even create an edge for your business and better your reputation. This could even encourage other industries to do the same! You have then successfully spread environmental awareness by making responsible waste management a priority. Like construction companies, logging businesses can be hard to maintain. With the complex processes and subsequent amount of waste they generate, it requires an efficient waste management system. Skip bins can be easily moved from one place to another. They are easy to detach from trucks when needed and are sturdy enough to get the job done. Mining is an industry that impacts the environment in polarising ways. Most of these companies mine for non-renewable resources such as uranium, gold, and oil. Hence, all possible measures must be undertaken to help reduce the negative impacts on the environment. This starts with a competent waste removal system. The way companies manage their waste determines whether or not they are affecting their surroundings in a good or bad way. Damaging effects will definitely harm the environment in the long run. This can all be avoided by implementing sustainable waste management measures. By hiring a skip bin service, you can also prevent potentially dumping hazardous chemicals and waste in the wrong places. That way, you actually also reduce your carbon footprint and help lessen the negative environmental consequences. If you think that only big businesses benefit from skip bin hire, then you are wrong. Homemakers can also take advantage of this service. Home-based workers can utilise skip bins to quickly get rid of any waste or rubbish that comes their way. Skip bins are also useful for when there is construction or remodelling being done on your home. Whether it is in the bedroom, kitchen, or outside in the garden, the use of skip bins is convenient! When trying to reduce your lawn area or remove soil and gravel, it’s helpful indeed to have a skip bin available for use. 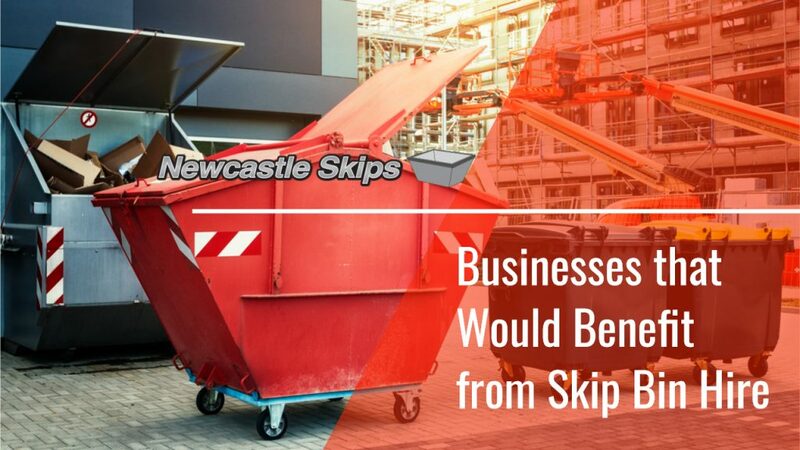 If you are looking for skip bins in Newcastle that can be used at your workplace or home, then look no further. Newcastle Skip Bins is the one for you! We’ve been in the skip bin business for years and are known for our excellent customer service and competitive prices. Contact us today on our website to find out more!